Ok. I’m calling it. 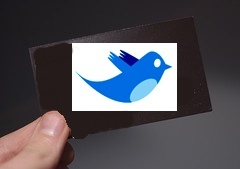 As of right now, Twitter handles are officially the new business cards. This article at Business Insider made me realize it, but I guess I’ve known it for a while now. A few months ago at CES, every time I ran into someone new and wanted to meet up with them again, I gave them my @brianmcc twitter address. I realized reading the above article that the same thing happened last weekend at SXSW. Just like Susy in the article, I wanted to understand why. Why did I make this choice? Why was it my default response? I certainly had business cards in my pocket. I remember specifically putting them in my jacket pocket every time I went out. But @brianmcc always won. What does this mean for the future of networking? And, specific to this blog, what does that mean for the future of job search? Twitter is just easy. @brianmcc. Done. I’m not forcing you to remember if it was Gmail, Yahoo, my corporate account, joe (dot) blow (at) whatever (dot) com. Anything. I’m not asking you to look me up on Facebook and send a friend request. Or send a LinkedIn request. @ and done. It’s easy. You can go look up my account (probably right there on the spot, on your phone) know who I am, follow me and remember me. There’s a good reason why business cards have ruled the roost for (50? 75?) years: they’re little snippets of information. They’re not resumes, but they’re placeholders FOR resumes. This is who I am. If you check my Twitter, you will know who I am, and if you follow me, you’ll remember me. Twitter serves the same placeholder, introductory purpose. And more interaction can follow later. If you want to follow up with me, probably my Twitter account tells you how to do so. Worst case scenario, you @reply or direct message me and we go from there. But, again, no easy-to-forget blahblahblah@media.somecorporatename.com. Just @brianmcc. Easy. Also, it’s on my phone. So if you want to meet up with me tomorrow for lunch, you’re more likely to reach me on Twitter vs. email, if I’m out and about. I’m likely to get the ping. Sure, other services are trying to make this easy and try to “own this space.” I certainly know people in HR circles for whom a LinkedIn account is just as golden. But not for all walks of life. For the random American, they’re more likely to have a Twitter account and understand how to use one. So if I meet you in the mix, Twitter is my safer bet. After all, you follow Ashton, don’t you? If I meet you, I’m 100% certain you have email. I’m 100% certain you have a Facebook account. And I’m 90% certain you have a Twitter account. Or, at least, you should. And so the @brianmcc thing is the easiest of those options with the greatest chance of future connection success across all walks of random interactions. And that runs true if you’re interested in my business, interested in my blogging or interested in the indie movie I’m producing. And I was there pimping all three. So I guess that was, in the end, why Twitter won out. We all understand by now that Facebook CAN be public. But not for everyone. So even if my Facebook page is one part of my public presence, I don’t know for sure that yours is. So I’m more comfortable reaching out to you on Twitter, which we all explicitly know to be a public medium. I assume that you can be reached there for public purposes. I might have seperate twitter accounts. Some people got my @thejobbored account if I thought they needed advice. But if I wanted to do business, I gave them @brianmcc. That’s where I do business. I think the business card has stuck around as long as it has because it was the most convenient, manageable placeholder for your public contact. It was easy to make, easy to give, easy to store and easy to make connections with. I’m beginning to feel like that is what your @twitter account is becoming. If you’re a networker of any kind (sales, recruiting, job-seeker, what-have-you-general-networking) I think you can and should be ready to use your Twitter handle in the same way.